Offer These Top 2019 Fitness Trends? The American College of Medicine recently released a report of the Top New Fitness Trends for 2019. Do you offer these options for your clients/members? Our clients are looking for variety, quality and accountability. Keep things interesting and they will keep coming back for more. Read the rest of Offer These Top 2019 Fitness Trends? It’s January and it is crunch time in the fitness industry. This is your ‘make or break’ time. Right now we all have the best opportunity to make the biggest impact on a lot of people’s lives. This is when people are thinking about getting back in shape. It’s just human nature that…come January….people are motivated to start working out and taking better care of themselves. Just check out Facebook – it seems that everybody is starting some type of challenge or cleanse! Remember that successful marketing for any business is being in the ”Client’s Mind When the Client is Ready to Buy.” And right now the client is definitely ready to take action! You need to be there to show them how you can help them achieve their goals! This is the time of year when most people WANT and NEED your help! Last week I reviewed the big picture attributes and commitments you need 1in order to run a successful fitness business. The next step is ensuring that you have a strong enough foundation to sustain all of the business you wish to create! If you haven’t taken the time to hash out these 5 things for your business…now is the time. ……Simple yet important aspects you MUST have to be successful and profitable! Have the belief that there is a potential to be extremely successful and profitable in the Personal Training industry and YOU can do it! Vision and imagination – as a leader you are able see more than what others can see and see the potential that others may not see! Have goals established for your business – be as detailed as possible so you can create and follow your map to success. Have Mentors/Consultants that You can rely on – from within the industry, business people outside the industry etc. Learn from others! Create YOUR Brand – who are you as a business? what is your competitive advantage? What do you do that others can’t? 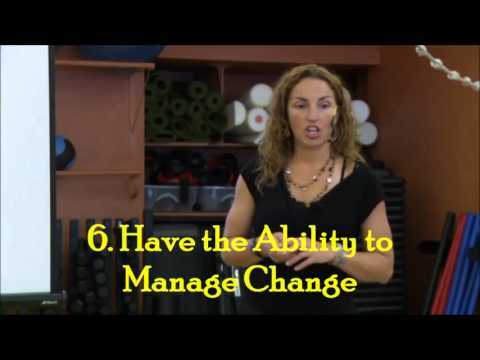 Have The Ability to Manage Change – you need to be OK with change and you need to teach your team to be OK with change. Make The Commitment – opening and running a business is a HUGE time, energy and financial commitment. This commitment must be part of your mindset so that you are ready to make it through the hard times and come out on the other side as a successful Fitness Business Owner! Stay tuned…next week I will tell you what you need in place on the operations side of things. VERY important stuff. Watch this 3 min video where I expand on these ideas. Remember, these are the 7 most important “Big Picture” things I believe every fitness business/personal training business owner/manager must have in place to be successful and profitable. Take a look at your business and be truthful. Do you have these 7 things? Like what you saw in this video and want more? Good news! I recorded 10 hours of DVD quality video where I walk you through what you really need to know about opening or running a personal training business. All the handouts to go along with the video! If you love the DVD Series so much that you want to purchase the full Business of Personal Training System….we will put the full price of the DVD Series toward your purchase of the Business of Personal Training System. Get these systems now to ensure a successful 2019 and write the cost of on your 2018 taxes! Hey fit pros… have you ever been to the IHRSA Convention? It is the best place to learn from and interact with other fitness business owners and managers. Remember, you can only stay on top of your game if you know what is going on in the industry and continue to learn the best ways to run your business. I will be presenting at the IHRSA 2019 convention in San Diego. I’ll be speaking along with over 75 incredibly inspiring individuals including four internationally recognized keynote speakers. Here at Northwest Personal Training & Fitness Education we have quite a lengthy apprenticeship program that helps us decide if a potential new hire will be an asset to our team and a good match for our team. Once that process is complete and the new personal trainer has accepted the offer, and employee agreement has been completed and wages have been established….our operations manager or personal training manager runs through this check list to ensure all necessary details have been taken care of.